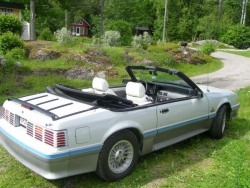 The 1987 Mustang GT charged into the new model year with both extensive restyling (inside and out) and with more wild ponies under the hood. With the competition hot on their heels, the Ford camp turned up the heat with the introduction of the ‘87 5.0L HO. The 5.0L EFI was upgraded a massive 25 horsepower with a hotter 302 featuring a bigger intake plenum and a larger 580 cfm throttle bore (increased from 58mm to 60mm along with a revised inlet duct). Needing to correct its poor decision to change the heads for the 1986 model year, Ford realized the casting molds were gone for the pre-'86 heads. Fortunately, Ford found a solution within its truck division. 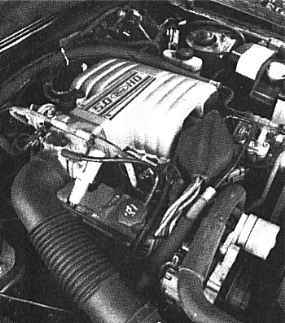 The 302 trucks used a cylinder head similar in design and performance to the old wedge-type heads and, being a direct fit, the E7TE truck heads were matched to the H0 5.0L Mustangs beginning with the '87 model year. These heads featured better breathing valves, opened-up exhaust ports, and 9.0:1 CR dished-top forged pistons replacing the previous year’s flat tops. 19 lb-hr. injectors, a tuned length aluminum manifold (with better flowing runners), roller lifter cam and EEC-IV electronics system all carried over from ‘86. Stainless steel exhausts teamed up with stainless steel tubular headers improved air flow, dumping into a common collector. As in years past, handling and suspension upgrades also showed gradual improvements. The front end geometry was refined with new strut housings and spindles and larger, 10.84-inch front brakes attempted to answer the call for more stopping power. Strut travel was increased and Ford engineers also dialed in more caster and negative camber to increase stability on cornering. Sway bar sizes remained the same as ‘85-’86 GTs. The above changes along with the exterior revisions set the tone for the next 6 years. 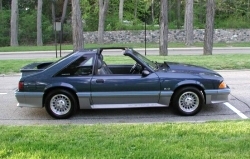 Although the basic chassis and body style was not changed, the 1987 Mustang GT (in both the hatchback and convertible model) was extensively restyled for the first time since its introduction eight years earlier. 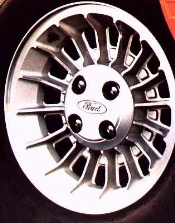 An extended rear quarter window replaced the false louvered trim, the front end treatment was smoothed out with flush-fitting headlamps, the air inlet between the headlights was filled in with the lower inlet becoming wider and slimmer, and a ground effects package with a revised rear wing became standard GT equipment Also new were the 15x7 inch “Turbine” wheels and louvered taillights. The only “GT” identification was the “Mustang GT” embossed in the ground effects skirts on the sides and the back of the car. Available external colors were: Black, Dark Grey Metallic, Oxford White, Light Grey, Scarlet Red, Medium Cabernet, Medium Shadow Blue Metallic and Dark Shadow Blue Metallic. A Titanium lower accent paint treatment was also available on the GT at no cost along with a red or blue bodyside molding insert stripe. Inside, the new GT design continued with a new dash, instrument panel, climate control knobs, seats, door trim and console. The 87 GT’s front seats featured new power adjustable lumbar support plus an adjustable under-thigh support and side bolsters. Interior trim options were: Scarlet Red, Medium Grey and Beige. Other standard GT interior features were tilt wheel, 7,000 rpm tach, swiveling map light, interval wipers, reminder lights for low fuel, low washer fluid, low coolant and “check oil” and center console. 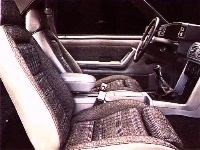 The brake and accelerator pedals were positioned to allow heel-and -toe downshifting and there was a new left side foot rest/support for the driver during hard cornering. This year for the first time a 7 band graphic equalizer was available to go along with the Premium Sound System four channel power amplifier and six speakers. 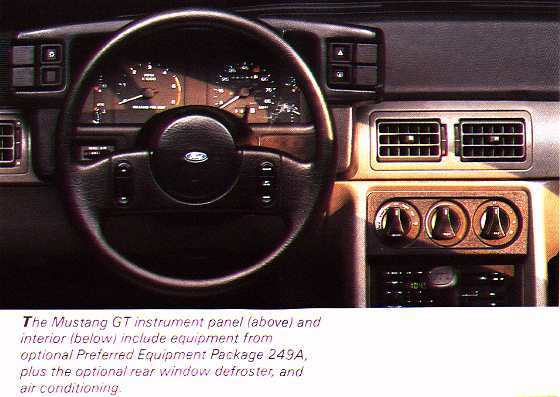 Other GT options were remote mirrors, sunroof, T-tops, rear defrost, air conditioner, rear window louvers and power windows and locks. 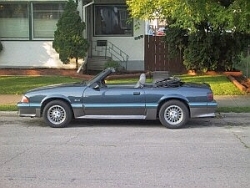 The 1987 model was perhaps the greatest and, for sure, the last significant makeover in the progression of the third-generation H0 Mustangs. The 1987 GT was far and away the most successful of the current generation GT’s. Reliable reports indicate Ford actually had some 10,000 unfilled orders at the end of 1987 production--the company simply ran out of parts to build the cars! Sources: Photo of engine - Road and Track Performance Cars, 1988. All other photos - Ford Mustang brochures. This area is still under construction. Please stop back in the future for a listing of 1987 GT options and prices as well as other data.